For some people, fishing can seem like a production—you must carry a heap of gear with you, and sometimes, that gear can be costly. But that’s largely a misconception: there are plenty of easy fishing projects that anyone can do (and for cheap)! Here are a few of our favorite DIY fishing projects that can be easily crafted and help you out a ton on the water! Let’s be honest: fishing rods can be a pain to travel with. Not only is the hook dangerous, but also, the awkward shape makes them hard to pack and carry. By crafting together parts of a PVC pipe, you can make a virtually costless traveling rod case for you and your buddies in no time. You’ll just need to cut the PVC pipe a bit higher than your rod, tape on a cap, add some foam for insulation, and there you have it: your rod is ready to travel! So, you’ve got your rods, your bait, and it looks as though you’ve caught your first fish. But what now? Where do you clean it? Often, fishermen just resort to the dock as a makeshift table, but this can be inconvenient and unstable. So why not try making your own? You’ll need a double sink, a piece of plywood, a bucket, and some lumber. And just some time to follow these directions—but it won’t take long. We’ve all been there before—for whatever the reason, you have to step away for a second, but there’s no one around to hold your fishing rod. You don’t want to take the bait out, because who knows if you’ll still catch a fish. Well, get that PVC out again—because you can easily make a rod holder for any sort of beach, or lakeside. Just make sure it’s in the ground steady. 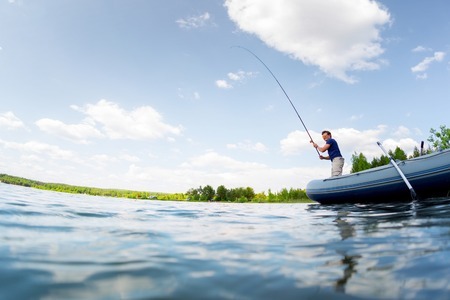 Fishing isn’t that hard to begin with—but with these handy crafts, you might have just made the sport that much easier! Once you have all of your DIY projects completed, take a turn on the beautiful Ogoki-Albany river system at Mattice Lake Outfitters. Call us at 1-800-411-0334 today to plan your next fishing trip!